Before you think I’ve went crazy or all of sudden can’t spell…ROLF stands for River Of Life Farms. In early April, Frank Terkhorn, Vickie and I journeyed to Dora, Missouri and spent a couple nights at ROLF. The whole things started a few weeks back when I decided I wanted to make a trip to south central Missouri and fish the North Fork of the White River that flows out of the Mark Twain National Forests, southward and eventually hooks up with Bryants Creek, then flows a couple more miles and enters Northfork Lake. You might guess that the North Fork of the White is a fly-fishing destination…and it is, in fact it is the only naturally reproducing rainbow trout stream in Missouri with a reputation for growing some large trout. I searched for places to stay in the area and came up with ROLF, then contacted Myron McKee, the owner and operator. You can visit the website and see all that they have to offer…I will tell you that we stayed at the newest cabin, the Lighthouse, and it was all and even way more than we ever thought it could be. The Lighthouse is built 60 feet high upon stilts and sits directly next to (it even seems to be over the river) the North Fork itself. The cabin has everything a person could ever want; its 1200 square feet has a central kitchen and living area with a bedroom on each side. The front bedroom has a sit-in bay window that opens to the river and sits just beside the hot tub (there is also one in the other bedroom). The large front porch has a view that is second to none and was where we spent most of our time…looking down the canyon and out over the river as you can look directly into the crystal clear water as it flows by, at times it was quite mesmerizing! Lastly, I must add that Myron was a pleasure to work with and answered our many questions and helped out at each and every turn…so, please take a look at the website and give the area and ROLF a visit. 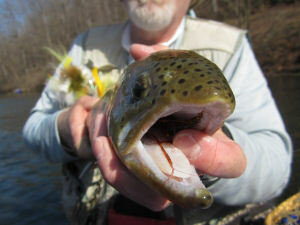 The North Fork isn’t a simple river to fish…by any stretch of the imagination. I knew going in that this was an exploratory venture and tried to put as little pressure upon myself as possible; the truth is that I couldn’t wait to get going and after a 7 ½ hour drive, a little time fly-fishing was just what the doctor ordered. 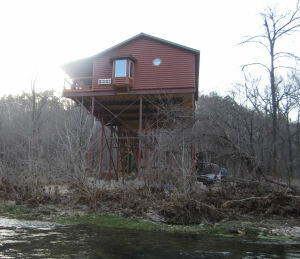 We talked to Myron and he suggested that we go upstream and put in just below the large Rainbow Springs and then float back to the cabin, so we pumped up our new Voyagers, lashed them to the top of my Suburban, drove a few minutes north and launched upon the cold, clear, 56 degree water as it flowed south towards Arkansas. The upper half of the river, below rainbow springs, is known for its native population of big, hungry rainbows… frankly rainbows aren’t known for being terribly aggressive with streamers, well at least the smaller ones-I was in hot pursuit of a big fish. I had my new 5 weight TQR rod with a Rio streamer line, along with a couple fly patches of bigger streamer flies and started casting at each likely looking spot along the way. Once again I knew this wouldn’t be easy but here I was, an hour in and hadn’t had yet even had a hit…it was at this point that my mind started wondering back to the many hours chasing trout; did I have the wrong color, wrong tippet size, stripping too fast, too slowly, etc…and it was at about that point that I felt a bang, not a tug on my line. My brain reacted and sent an impulse to my left hand, whereby my left hand strip set and as they say…the battle was on! The first few seconds are the best as I didn’t know what I had…I just knew that it was big. I kept my composure and got the fish on the reel and it was at that moment that up out of the water launched a big and very colorful rainbow. Patience, patience…I kept reminding myself, don’t get crazy and try and crank in a big fish that was using the river current to its own benefit. My little 5 weight rod was bent double and my arm was extended straight up trying to use the drag of the reel to tire the behemoth as it pulled tirelessly against my 3X tippet! As you can see from the photo above…I did eventually net my trophy, a 21 inch buck rainbow. I was able to share this special moment with Frank and he obliged me by taking a few pics of me and this amazing fish before we watched as it eased its way back into the cool, clear waters of the North Fork River. >>> Click Here <<< to listen to a short synopsis of the North Fork of the White River. After floating most of the lower sections I have a much better idea of where to put in and take out as well as where you might find some of the better fishing. For those of you looking for some great fishing in a truly magnificent wilderness area, please give the North Fork River area some consideration and give Myron a call at River of Life Farms. You will find that the river and the accommodations are both second to none; I hope to see you along the way as we all Enjoy the Great Outdoors.